was the best I found online but it was a lot easier to learn from a person. 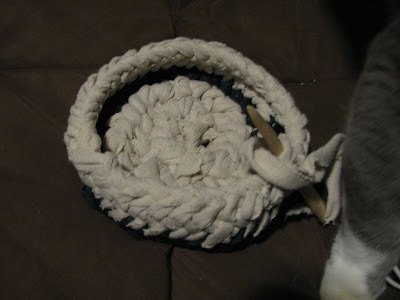 I, of course, didn't want to do easy beginner stuff so I did round instead of oval and decided to figure out how to build up into a basket. Much more gratifying to walk out of the workshop with this half-done basket than a one hundredth done rug! I really the technique, although pulling everything through every stitch feels so inefficient after so many years of knitting. It makes a very dense, almost indestructible, very stiff fabric. 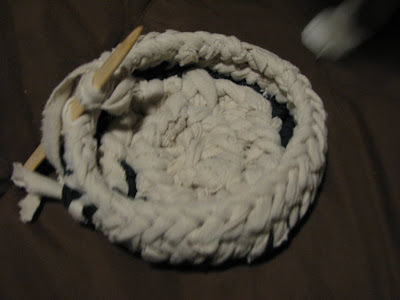 The "wrong" side shows inside the basket bottom and the "right" side looks like braid. It can be seen on the outside face of the basket. I was working with knits but she has done quite a bit with woven cotton (calicos). I'm hoping to use the technique for the pounds and pounds (boxes and boxes) of wool rug strips left to my mother and me by my grandmother. Q started a three week jewelry making class the same night. It's great to have the resource available. They have equipment available during open studio times for jewelry making, woodworking, ceramics, photograph developing, fiber arts and glass. 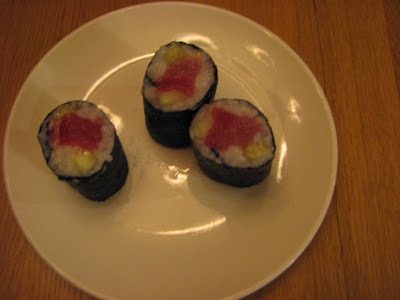 Last but not least, I must present last night's sushi - tuna and cucumber. This is the third time I've made sushi and my rolls are now firm and picturesque. I still need to make slightly less gloppy rice though. I also need to expand out to more/different ingredients. If only food were photogenic. I've become more and more impressed with food photographers. I have yet to take a food photo I'm happy with. They always end up looking too...visceral?